Office Space - Edwinstowe, Nottinghamshire. 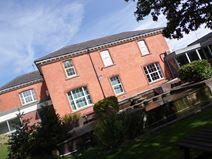 Situated in the world-famous Sherwood forest this traditional Georgian building is now home to a range of flexible serviced offices up to 5,000 sq. ft.